Professional services networks are networks of independent firms who come together to cost-effectively provide professional services to clients through an organized framework. They are principally found in law and accounting. They may also be found in investment banking, insurance, real estate and architectural services. Any profession that operates locally, but has clients in multiple locations, are potential members of a network. This entry focuses on accounting, legal, multidisciplinary and specialty practice networks. Today members of these networks employ more than one million professionals and staff and have cumulative annual revenues that exceed $200 billion. The accounting networks and associations developed first to meet the requirement of the SEC of public company audits. They include the well-known accounting networks like PwC, Deloitte, Ernst & Young and KPMG (also known as the Big 4 Audit Firms) as well as more than 30 other accounting networks and associations. They are highly structured entities. The law firm network developed in the late 1980s. They include legal and law firm based multidisciplinary networks like Lex Mundi, World Services Group, TerraLex, Meritas, and the State Capital Group. There are more than 175 known networks in law, 40 in accounting, and 20 specialty networks. Individual networks have revenues exceeding $20 billion. Growth professional services networks based upon review of directories of law and accounting networks and associations. 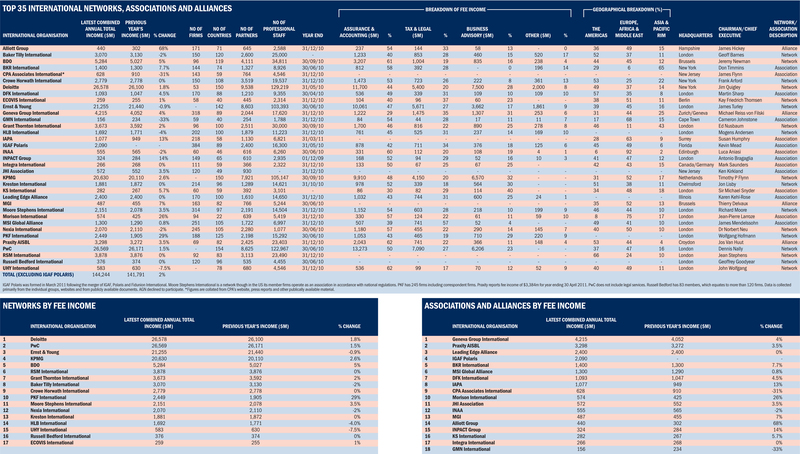 Table of largest professional services networks based upon the number of partners from survey conducted in 2011 of 200 legal and accounting networks from sources above. The table does not reflect the level of development of the network. Accounting networks are far more developed. Every network from accounting networks like PwC and KPMG to law firm networks like Lex Mundi, Multilaw, and multidisciplinary networks like World Services Group(WSG) uses a “network disclaimer.” A network disclaimer states that the network members are independent firms that do not practice jointly and are not responsible for the negligence of each other. It further states that generally the network does not practice a profession or otherwise provide services to clients of the network’s members. This independence is the foundation of both network operations and governance. One of the major factors influencing the need for networks is the globalization of the economy. Supply and demand are no longer local but global. The price of commodities is affected by the weather halfway across the world or by demand in developing countries. Production takes place wherever the assets and human resources can most effectively deploy. Professional services providers must be able to reach out globally to represent their clients everywhere in the world. Networks are the practical and cost-effective method to accomplish these objectives. Members of networks have access to other members who understand the local economic, legal and political factors. From a theoretical point of view, networks are an effective model of enhancing services. The members and the networks are different parts of the resource equation for providing members quality, reliable, local and global services. There is no real limit of what can be accomplished through a network when the network and its membership work in combination with each other. This collaboration is at the heart of the network. Networks do not practice a profession or provide the services that their members provide to their clients. Networks do not provide accounting or legal services. They operate for the benefit of the members by supporting their operations. The network can combine the resources of the individual members without risking the loss of their personal identities or financial independence. A network is more than a support organization or collaborative framework in which the members can meet clients’ needs. It is an entity that has a common corporate identity or brand. The network name can represent a standard that is required of all its members. The logo and brand are owned by the network, not the members. Membership can create a global corporate identity. The objective of this identity is network participation that will translate into business for the individual independent members. For a company to internally develop a global and local presence would take decades and billions of dollars. For a company/firms to start a network that develops the same market penetration may take a decade and cost only millions of dollars. However, these costs are allocated among the full membership so the cost per member is low. The cost for future members to gain direct and immediate access to these resources is de minimis. Professional service networks are sui generis, and each network is formed for a different reason. Current and potential members are attracted to networks in which they can pursue their own individual objectives. While networks clearly do have things in common, each must be viewed in the context of its uniqueness. A successful network is one that meets the expectations of all of its members. The objective of a network is to create a framework which can allow the members to expand their services. Within the network they can operate to pursue their interests. These interests can include referrals, joint venturing, access to expertise, developing regional expertise, publishing articles for clients, branding, technical information exchange, market positioning, pro bono services, etc. The scope of these interests is defined not by the members but by the network. Network organizations are defined by their purpose, structure and process. The purpose of a network is different from that of a company or professional firm in that it is limited to specific activities that will benefit its members and enhance its performance. The network’s structure reflects the activities it seeks to promote and the underlying cultures of the members. Accounting, legal, multidisciplinary and specialty networks will each be different. The process is defined by how they are governed and operated. Networks are created around common specialized assets, joint control, and a collective purpose. The specialized assets reflect the defined activities of the network. In order to have joint control of the assets, there needs to be collaborations among members. The collaboration necessitates a commonly understood purpose or purposes. A professional services network is neither a mere extension of the members nor only a support organization for independent professional services firms, but is rather an independent organization. It is also a business, and very different from professional associations such as bar, accounting and other associations whose membership is generally open to all qualified professionals. When asked why they joined, members usually state that they joined for tangible reasons: to receive referrals from other members, to have reliable firms to which they can refer, to maintain independence, to meet clients’ needs, to retain existing clients by being able to provide services in other states or countries, and to obtain new clients in their market who know of the membership. They may also want to exchange knowledge that can reduce risks in their own firm's operations, or gain access to other resources. Network members also minimize possible losses by spreading risks. Membership is a proactive way to profit from change and at the same time to conserve resources. Membership can also enhance the prestige of the member by being associated with prestigious firms that the client is already using. Networks achieve these objectives through different corporate structures in which executives have command and control. ^ “PricewaterhouseCoopers" and "PwC" refer to the network of member firms of PricewaterhouseCoopers International Limited (PwCIL). Each member firm is a separate legal entity and does not act as agent of PwCIL or any other member firm. PwCIL does not provide any services to clients. PwCIL is not responsible or liable for the acts or omissions of any of its member firms nor can it control the exercise of their professional judgment or bind them in any way. No member firm is responsible or liable for the acts or omissions of any other member firm nor can it control the exercise of another member firm's professional judgment or bind another member firm or PwCIL in any way." ^ "International Cooperative (“KPMG International”), is a Swiss entity. Member firms of the KPMG network of independent firms are affiliated with KPMG International. KPMG International provides no client services. No member firm has any authority to obligate or bind KPMG International or any other member firm third parties, nor does KPMG International have any such authority to obligate or bind any member firm." ^ Lex Mundi members are not affiliated in the joint practice of law; each member firm is an independent law firm and renders professional services on an individual and separate basis. ^ Sheth, Jagdish (1994). "Strategic Importance of Information Technology". Advances in Telecommunications Management. 4: 3–16. ^ Perera, H.A. Rahman and S. Cahan (2003). "Globalization and the Major Accounting Firms". Australian Accounting Review. 13 (1): 27–37. doi:10.1111/j.1835-2561.2003.tb00217.x. ^ Ring, P.S. and A.H. Van de Ven (1992). "Structuring Cooperative Relationships Between Organizations". Strategic Management Journal. 13 (7): 483–498. doi:10.1002/smj.4250130702. ^ Van Alstyne, M. (1997). "The State of Network Organizations: A Survey of Three Frameworks". Journal of Organizational Computing. 7 (3). ALFA International The Global Legal Network Inc., commonly known as ALFA International, is a global legal network consisting of 150 independent law firms, including 80 U.S. law firms and 70 member firms in other countries. As with other types of professional services networks, the organization serves as a business referral and resource pooling network between member law firms. Accounting networks and associations are professional services networks whose principal purpose is to provide members resources to assist the clients around the world and hence reduce the uncertainty by bringing together a greater number of resources to work on a problem. The networks and associations operate independently of the independent members. The largest accounting networks are known as the Big Four. Alliott Group is an international association of accounting firms and law firms that provide audit, accountancy, tax, real estate, M&A, global mobility, commercial law and private wealth services. It ranks as one of more than 200 professional services networks worldwide. The association was established in 1979 and comprises 150 member firms in some 160 cities across 64 countries. The alliance aims to be a Top 10 ranked alliance by the end of 2021 and to achieve this by appointing an accounting and law firm member (dual coverage) in the majority of the world's commercial hubs. Member firms are independent, mid-market professional practices. At the end of 2018, Alliott Group was ranked by Accountancy Age as the 13th largest international association of accounting firms with aggregated revenues of approximately USD628 million.In October 2016, at the International Accounting Bulletin (IAB) Awards, Alliott Group was presented with the "2016 Rising Star International Association of Accounting Firms of the Year" award.Through its member firms, the association offers services to Small and medium-sized enterprises across a number of sectors and has services groups focused on international tax, VAT/indirect tax, transfer pricing, private wealth, global mobility, commercial law, real estate and M&A. The Big Three or MBB refers to the name colloquially given to the world's three largest strategy consulting firms by revenue. They are also considered the most prestigious employers in the management consulting industry. McKinsey is the biggest of these with an annual revenue of $8.8bn (2016) followed by Boston Consulting Group ($6.3bn revenue; 2017) and then Bain & Company ($3.8–4.5bn revenue; 2017 estimate). Deloitte Touche Tohmatsu Limited , commonly referred to as Deloitte, is a multinational professional services network. Deloitte is one of the "Big Four" accounting organizations and the largest professional services network in the world by revenue and number of professionals.Deloitte provides audit, tax, consulting, enterprise risk and financial advisory services with more than 286,200 professionals globally. In FY 2018, the network earned a record $43.2 billion USD in aggregate revenues. As of 2017, Deloitte is the 4th largest privately owned company in the United States.As of 2015, Deloitte currently has the highest market share in auditing among the top 500 companies in India. Deloitte has been ranked number one by market share in consulting by Gartner, and for the fourth consecutive year, Kennedy Consulting Research and Advisory ranks Deloitte number one in both global consulting and management consulting based on aggregate revenue. A financial audit is conducted to provide an opinion whether "financial statements" (the information being verified) are stated in accordance with specified criteria. Normally, the criteria are international accounting standards, although auditors may conduct audits of financial statements prepared using the cash basis or some other basis of accounting appropriate for the organisation. In providing an opinion whether financial statements are fairly stated in accordance with accounting standards, the auditor gathers evidence to determine whether the statements contain material errors or other misstatements. Hitachi Consulting Corporation is an American international management and technology consulting firm with headquarters in Dallas, Texas. It was founded in November 2000 as a subsidiary of the Japanese corporation Hitachi, and it currently employs approximately 6,500 people in the US, Japan, Brazil, China, India, Portugal, Singapore, Spain, the UK, Germany, and Vietnam. In management, information technology consulting (also called IT consulting, computer consultancy, business and technology services, computing consultancy, technology consulting, and IT advisory) as a field of activity focuses on advising organizations on how best to use information technology (IT) in achieving their business objectives. JuriNet Ltd is a syndicate of law offices and business partners in Finland and worldwide and one of the biggest Finnish B2B service provider to offer law firms a customer-oriented marketing and information channel. A law firm network (law firm association or legal network) is a membership organisation consisting of independent law firms. These networks are one type of professional services networks similar to networks found in the accounting profession. The common purpose is to expand the resources available to each member for providing services to their clients. Prominent primarily law firm networks include Alliott Group, Lex Mundi, WSG - World Services Group (multidisciplinary), TerraLex, Meritas (law), Multilaw , The Network of Trial Law Firms, Inc., the State Capital Group, and Pacific Rim Advisory Council. The largest networks have more than 10,000 attorneys located in hundreds of offices worldwide. The firms who are part of the networks may be formally or informally linked to one another depending upon the purpose of the network. Multidisciplinary professional services networks are organizations formed by law, accounting and other professional services firms to offer clients new multidisciplinary approaches solving increasingly complex issues. They are a type of professional services network which operates to provide services to their members. They operate in the same way as accounting firm networks and associations and law firm networks. They do not practice a profession such as law or accounting but provide services to members so they can serve clients needs.Aim is to provide members involved in doing business internationally with access to experienced, tried and tested, reliable, and responsive professional advisers who know their local jurisdiction intimately as well as the intricacies of cross border business. There are 10 multidisciplinary networks. The largest are: Alliott Group, MSI Global Alliance, Morison International, Geneva Group, International Practice Group, WSG - World Services Group and Russell Bedford International. These networks have more than 100 member firms in as many as 90 countries in hundreds of offices. The members employ thousands of professionals. PLMJ is a Portuguese law firm with its headquarters in Lisbon. PLMJ is a full-service, multidisciplinary firm advising Portuguese and multinational businesses, and financial and state institutions on a range of domestic and international transactions. More than 290 lawyers including 58 partners and around 100 support staff work in PLMJ’s nine offices spread across seven countries in Europe, Africa and Asia.PLMJ is a member of World Services Group and World Law Group, two international multidisciplinary professional services networks of independent accounting and law firms. Towers Watson & Co. was a global professional services firm. Its principal lines of business were risk management and human resource consulting. It also had actuarial and investment consulting practices. In January 2016, Towers Watson merged with Willis Group to form Willis Towers Watson.